There are a number of “features” in reprap host that make it confusing to use. So much so that most people seem to have given up on it and now recommend either using Skeinforge or Repsnapper. The MaximumFeedRateX and MaximumFeedRateY parameters do effect the feedrate, but only when using the axis jog dials. When printing, or using the Home button (in the same screen as the jog dials!) The firmware settings are used. The Extruder control tab seems to start off with the extruder set to reverse despite the reverse checkbox being un-checked. You have to check and uncheck it to get it to be correct. Also because the ramp button does not properly change the up/down state of the heat button by playing around you can get various confusing combinations of state compared to the text that tells you what the state will be when you press it! The Ramp button is only really needed for drying cement, (i.e. part of the extruder manufacturing process) Its really confusing to have this button on the tab at-all, especially in combination with the above feature. The Layer height preference must be set the same for all extruder’s. If different settings are used for each extruder the software makes a calculation error and starts the print at Z4.0 i.e 4mm above the bed! This one caused me a lot of pain recently as I had no clue as to why the gcodes being generated would be wrong. it was only by chance that I ran reprap from the command line and noticed an error message saying that they were different, and luckily guessed that this was the cause. The documentation suggests that by changing InterLayerCooling to false and setting Extruder0_CoolingPeriod to -1 that the machine will not return to the home position between each layer, however looking through the source code it is apparent, that it is impossible to disable Homing. The software needs to be fixed to achieve this. Finally Reprap host is incredibly slow, its about 10x slower than Skeinforge, and Skeinforge is about 10x slower than Repsnapper, making Reprap host 100x slower than Repsnapper! I should think the reason for this is probably the use of TeMpOrY gcode files rather than using memory mapped files or something else. When I run reprap host, my system usually grinds to an unusably slow rate for 10 mins or so. Repsnapper generates gcode for the same file in a number of seconds. RepSnapper is still in early beta, mostly because the gcode generation is not perfect yet. Mostly, the “fast” mode sometimes makes some errors in the gcode. The “Perfect” mode is almost perfect, but does not allow you do to multiple shells (outlines around the infill) and the perfect mode is too slow. 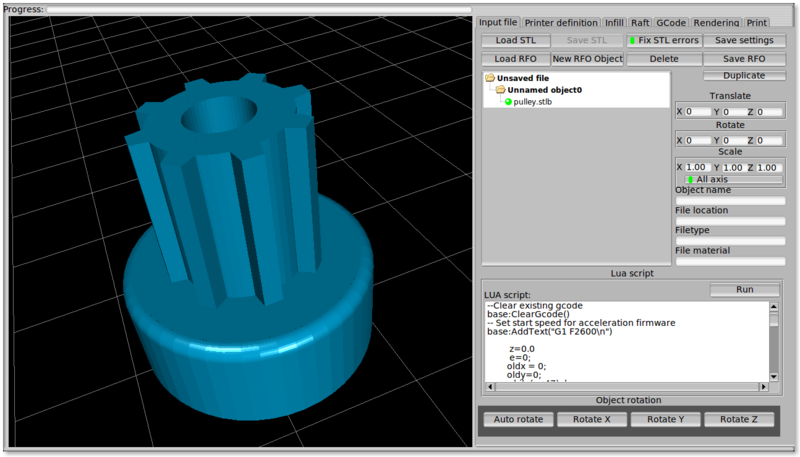 Also the current version uses GPC (general polygon clipper) library, which uses another license then the reprap project. When I get these details fixed, there will be a general release of RepSnapper. Mail me one of your ascii files, and I’ll fix it in a few days. That is obviously the most useless example, $MaxFeedRate would allow you to make your own customized dynamically generated shields and that sort of thing. Oh, BTW, your STL file loads fine on windows RepSnapper, but parts of it processes badly (like the lower 5 mm) The root of the problem is that there’s several vertices on the same XYZ coordinate, up to 6 at the very same position, and I don’t merge them at load time. I’ll fix this over the next week. Your script example certainly looks very powerfull, at the expense of making the text less readable. Its a shame lua dosen’t have a way of embedding code within text, such as like PHP. I gave it a shot, but as Giles pointed out, it appears to only build under Windows at the moment, due to use of some Windows-only constructs and system calls; things like use of the win32 WaitForSingleObject() in RepRapSerial.cpp. Once it build cleanly under Linux, I might give it another shot – give me a ping. I found the following portable thread classes making Repsnapper use these in RepRapSerial.h/cpp instead of windows specific events and threads will ease re-porting to Linux. I started to look at this myself, but it would probably be much easier for Kulitorum or Marius since my C/C++ skills are a bit rusty. Thanks for the reference, but when I start doing multithreaded code, I’ll use OpenMP which is also cross-platform and becomming the standard in almost every compiler out there. I did’nt make that – I’ll mail the guy who did. Can either of you guys tell me what the kick button is supposed to do? Is there a method to make the extruder back up a few counts at the end of a line to stop nozzle drool and stringy parts? I there a tool to edit the Gcode start middle and end scripts or do you just have to modify the xml file like I have been doing? I don’t think there is any extruder reversing feature in repsnapper currently although I have heard that its a planned feature. There is however already the ability to edit “Start” “Next layer” and “End” GCode sections within the GUI, so if thats not available for you maybe you have an older version of the software. I am getting random communications errors that send the machine to destinations unknown. If you let it run until it gets there it will come back and start printing again. It is not in the Gcode and we swapped out the main board. I am running the march release of 5D firmware and Repsnapper from the link listed above. Any ideas? I’m still at yahoo groups, I didn’t figure out how to get into the irc repsnapper channel. Could you spell it out for me! We flipped the motherboard ( same march copy of 5d) the laptop and the stl file. It still comes up with random moves that aren’t in the g code. It has happened on the X,Y and E axis so something has to be telling it to go there.